Sniffles be damned- I felt pulled to the forest! The winter wonderland conditions were perfect and it’s been so long… So hubby watched Bee while I pulled my boots on and headed into the forest. It always feels like visiting an old friend. As always I brought offerings, along with the remaining mini pumpkins. The wee Nature Spirits will like them! 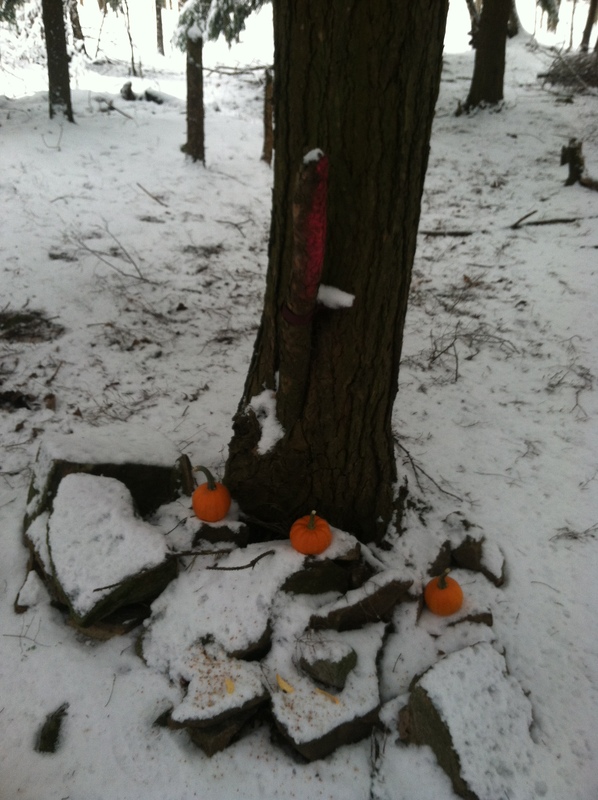 I was sad to see some pink spray paint on the tree I built a shrine under. There was some sporadically sprayed here and there in the general area, mostly in the form of sloppy initials. Hoodlums. I can’t believe I just typed that word, but it’s true. Hack marks here and there revealed that someone was also playing with a throwing axe. It’s a shame I have to share this sacred place with people who mar the trees. All the same, the trees are strong. They weather harsh winds and freezing rain on their branches. They teach me to be strong and continue to grow despite mistreatment and challenges I encounter. I must visit them more frequently now that Bee is a little older. I want to show them the respect elders are due, and maybe learn more from their silence.